In 1983, Texas Instruments announced the cancellation of the 99/4A Home Computer. This was shortly after they announced their intention to produce its successor, the TI-99/8, a computer with the "big brother" to the 4A's TMS9900 processor, the TMS9995. Myarc was a company that made a name for itself selling expansion cards for the TI's Peripheral Expansion Box, including memory, RS232, and disk controller cards. They also produced a "replacement" for the large PE Box in a smaller self-contained unit. Then, Myarc dropped the bombshell that they were producing an "upgrade" computer. The unnamed machine - actually just a mock-up in a shell very similar to the 99/8, was shown at the large, annual Chicago TI Faire. After a few years of false starts and production delays, the Myarc Geneve 9640 Family Computer was for sale. The TI PE Box attached to the 4A via an interface card and large "firehose" cable. 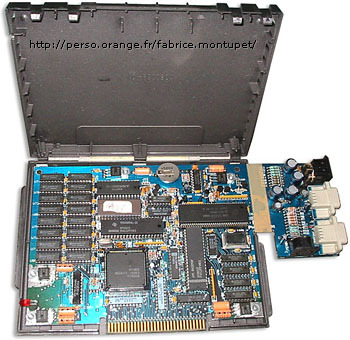 The Geneve replaced this card, its cable, and the TI console itself - a "computer on a card." It featured the faster processor meant for the 99/8, 80-column high-res graphics (composite and RGB interfaces were included), the ability to run almost all 4A software (including cartridges saved to a disk format), mouse and joystick interfaces, an IBM-style keyboard, and an Operating System somewhat similar to DOS. The system shipped with mostly incomplete software, and this ultimately led to the demise of Myarc and the machine itself. Today, Genve's can be found but are fairly rare. see more Myarc Geneve 9640 Ebay auctions !